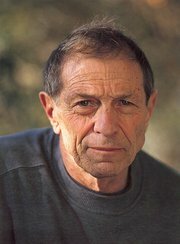 David Goldblatt, one of South Africa’s most famous documentary photographers, is internationally acclaimed for his work. The grandson of Lithuanian-Jewish immigrants, he was born on 29 November 1930 in the small mining town of Randfontein, Johannesburg, Transvaal (now Gauteng). David was the third son of Eli Goldblatt and Olga Light, both of whom came to South Africa as children with their parents to escape the persecution of the Lithuanian-Jewish communities in the 1890s. David’s interest in photography was sparked by his mother giving him a camera. His brother, Dan, had served in the merchant navy and had brought a Contex camera home after his service. David’s parent’s purchased this camera, thus encouraging him to pursue his interest in photography. In 1948 David matriculated and set his sights on a career in photojournalism. He was largely influenced by the work of the famous photographers working for American-European magazines such as Life and Picture Post. In the 1950s, David started photographing the unfolding political campaigns mounted by the Congress Alliance, however he found the pursuing of news very unrewarding. In 1955 he married Lily and they had three children. Influenced by their beliefs - and not wanting to bring their children up in a racist society, David and Lily decided to immigrate to Israel. Their plans were put on hold when David’s father became ill with cancer and someone had to take over the family’s men’s outfitting business. David undertook the responsibility whilst studying part-time at Witwatersrand University in Johannesburg. In between running the family business and studying for his Bachelor of Commerce degree, David continued to take photographs in his spare time. After the death of his father in 1962, David sold the family store and on 15 September 1963, at age 33, he ventured out to work full time as a professional photographer. David became part of the intellectual and artistic community of white Johannesburg; he became friendly with many of Johannesburg's leading white liberal literary and artistic figures. It was through his friendship with the writer Lionel Abrahams, who was the editor of the work of Herman Charles Bosman, that David began exploring and photographing the Afrikaner farming community of the Groot Marico district in the then Western Transvaal. His big break as a photographer came in 1964 when he was given a number of assignments by Sally Angwin, the editor and owner of the avant-garde Tatler magazine. David did a feature for the magazine on the Anglo-American Corporation and this eventually led to long and important association with Anglo's in- house magazine, Optima. David’s association with Optima gave him access to the mining operations of the most powerful South African company. This, in turn, allowed him, over the next decade, to complete his book On the Mines (published in 1973), as well as to travel around the country taking photographs for his seminal book Some Afrikaners Photographed (1975). He also worked on a book about middle class which South African’s, In Boksburg, as well as projects on Transkei, Soweto and the city of Johannesburg. By the end of the turbulent 1970s, Goldblatt had built a reputation as one of the country’s leading documentary photographers. While he was like most progressive white liberals, privately opposed to the Afrikaner Nationalist government, he steadfastly avoided any active political involvement and did not photograph any of the turning points in South African history, such as the 1973 Durban strikes or the June 16th youth uprisings. In 1972 Goldblatt spent six months photographing in Soweto and from 1976 – 1977 he travelled on a bicycle photographing mainly the Johannesburg Indian area of Fietas (Pageview) - the community was facing removal in terms of the government’s Group Areas Act which forcefully removed people to new segregated townships. In 1979 Goldblatt began working on a project about life in a typical white suburb of the Transvaal – this lead to the publication of the book In Boksburg. In the 1990s, Goldblatt argued that he would neither join a political organisation - because he was not a “joiner” - nor allow his work to be used “by either side of the struggle” for propaganda purposes. Nonetheless, he participated in the Staffrider Exhibitions, organised by the leftwing anti-apartheid photographers’ collective, Afrapix. He also participated in the seminal exhibition, South Africa the Cordoned Heart (1985) curated by fellow photographer Omar Badsha, a founder of Afrapix. He was asked by Badsha to cover the story of workers who travelled an average of four hours per day by bus between the homelands and cities like Pretoria. This assignment led to the book The Transported of KwaNdebele: a South African Odyssey, (published in 1989). Goldblatt was present at the 1982 Culture and Resistance Conference in Botswana where he argued against photographers using their craft “as a weapon” in the struggle. He argued that the role of a photographer was to go beyond the surface of things and to make a far more compelling argument against the system of white rule. In the 1980s Goldblatt teamed up with Hugh Murray, the owner and editor of Leadership magazine, which was directed at the corporate world. Goldblatt’s role as the photographic editor of the magazine gave him the opportunity to publish the work of many of the younger documentary photographers. In the 1980s Goldblatt also began working on a 15 year project that would culminate in the publication of South Africa the Structure of Things Then (published in 1998). In 1985, the London office of the African National Congress (ANC) called for a boycott of his exhibition that was touring Britain. The ANC made this call as it believed that he had defied the cultural boycott and that he worked for Anglo-American Corporation. Subsequently, the boycott was relaxed when people like Badsha and the acclaimed South African novelist, Nadine Gordimer, called for the boycott to be lifted against him. Goldblatt then donated the entire exhibition to the Victoria and Albert Museum in London. In 1989, together with some friends, Goldblatt raised funds to set up the Market Photography Workshop in Johannesburg. What is not well known is that Goldblatt initiated the first open dialogue between the South African captains of capital and the ANC. He and Murray were in Lusaka to do a feature on President Kaunda and after the interview Goldblatt suggested that they try and get an interview with Oliver Tambo, the head of the then banned ANC. This meeting Murray set the ball rolling and the first meeting between Capital and the ANC was held in 1985 in Lusaka. In 1992 David Goldblatt joined South Light, a photographic agency established by Paul Weinberg and other photographers after they left Afrapix. On the 8 March 2006, Goldblatt was honoured for his portrayal of social and political life in the country of his birth. He received the 2006 Hasselblad Foundation Award in photography, which is considered the most prestigious photographic award. He was one of the first South African artists to be represented in the New York Museum of Modern Art and his work is exhibited and collected in some of the leading galleries around the world. Goldblatt continued to work until his death. The Goodman Gallery in Johannesburg houses and exhibits a great deal of his life’s work. It said recently an agreement with Yale University, United States of America was signed, transferring Goldblatt’s entire archive of negatives to the university. The Gallery also added that a digital archive of his work will be created in South Africa and made available to the public for free through an initiative named the Photographic Legacy Project. His book, Particulars, was awarded the Arles Book Prize for 2004. In 2006 he was given the Hasselblad Foundation International Award in Photography and in 2009 the Henri Cartier-Bresson Award. He received honorary doctorates from the University of Cape Town and the University of the Witwatersrand and the San Francisco Art Institute. His work has been exhibited in museums in South Africa, United States, Europe and Australia and is held in many public and private collections. In 1989, Goldblatt founded the Market Photo Workshop with the principal objective of teaching visual literacy and photographic skills to people disenfranchised by apartheid. David Goldblatt passed away in Johannesburg, Gauteng, South Africa, on Monday, 25 June 2018.